Sales teams work so hard, they can burn out quickly. It’s tough when customer contacts, sales goals, productivity tools, and social networking are all separated and siloed. Instead of working in separate systems that make day-to-day selling complex, you can help simplify the way your sellers work. And empower your team to be more productive and efficient. 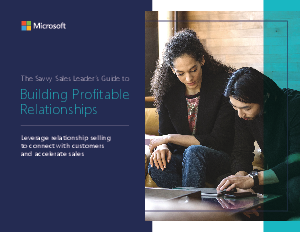 Our e-book, “The Savvy Seller’s Guide to Building Profitable Relationships,” is packed with advice for making selling much less painful—and more profitable. Motivate your team for smarter selling. Get our e-book today and get going on motivating your team to digitize their sales process.